After the parameters are set, they are used in route calculation from that time on. Navigation for trucks. For the best computing suitable for your vehicle, please set your truck attributes. Compared to RV / camper / bus navigation it includes: extended truck parameters (axle weight, axle load, nubmer of trailers, hazardous materilas, ADR tunnel codes), routing optimized for truck vehicles, information about time restrictions for trucks delivery in cities, truck restrictions in maps. Navigation for big non truck vehicles like busses or campers. For correct navigation, please enter your vehicle physical parameters – maximum speed, vehicle weight, lenght, width and height. The navigation will avoid the physical restrictions, but it will let you in city centers and areas prohibited for trucks in general. Car navigation for small vans with no need to set any vehicle parameters. Compared to car navigation, it will let you in delivery zones. If you navigate to a delivery zone within its delivery hours, you will be navigated to your destination. If you try to navigate there outside the delivery hours, you will be navigated to the closest reachable point as with car navigation. Normal navigation for cars with no need to set any vehicle parameters. With car navigation you will never be navigated to a pedestrian zone. Instead, you will get a message, that your destination is not reachable and you will be navigated to a closest reachable point. Max speed Maximum allowed speed for your vehicle When the actual speed exceeds this max speed the audio notification will be given by navigation. The parameter also affects ETA calculations. 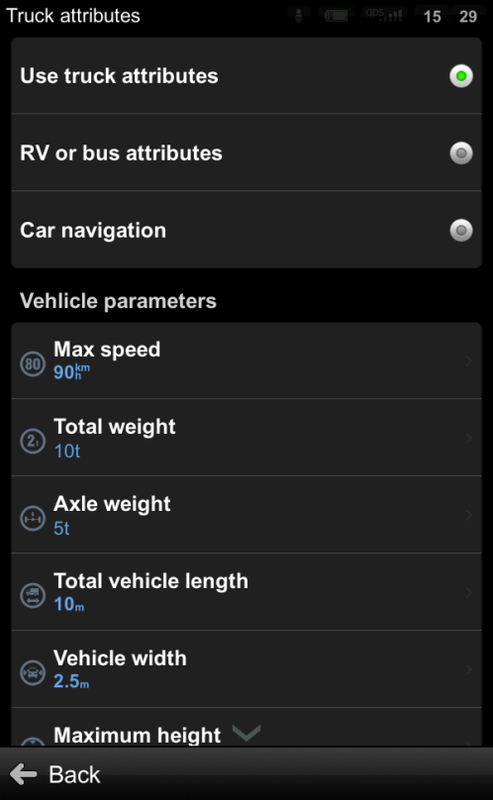 Total weight Total weight of the vehicle including load Sygic will calculate the route using roads where limit is not higher then total weight of vehicle. For example Sygic will not guide driver via bridges with lower tolerance then max weight. Total vehicle length Total vehicle length (only vehicle without trailers) Sygic will calculate the route using roads where limit is not higher then total weight of vehicle. Vehicle width Total vehicle width Sygic will calculate the route using roads where limit is not higher then total width of vehicle. For example Sygic will not guide driver via tunnels, bridges, lane with lower tolerance then max width. Maximum height Maximum height of vehicle Sygic will calculate the route using roads where limit is not higher then total height of vehicle. For example Sygic will not guide driver via tunnels, bridges with lower tolerance then max height. Axle weight The heaviest axle weight Sygic will calculate the route using roads where limit is not higher then axle weight. Hazardous load Specify, whether your load is hazardous and hazardous types. The settings are different for Europe and U.S. maps.